Doncaster Knights have taken Harrogate pair Callum Irvine and Sam Brady on trial. The young duo will train with the Knights but continue to play for the National Two North outfit. Fly half Irvine, 21, was instrumental in the Claro Road side finishing fourth in the league and lifting the Yorkshire Cup. Second rower Brady, 24, has represented England Students and helped Leeds Beckett University win the BUCS Championship. Doncaster’s director of rugby Clive Griffiths said: “The basic arrangement with both Callum and Sam is that they will come and train with us in pre-season, having trained with us a bit towards the end of year. “It will be a case of wait and see how it goes with both of them really. “I watched Callum play for Yorkshire this year in the County Championship. Unfortunately I missed Sam because he received a ban in the Yorkshire Cup final win against Wharfedale. 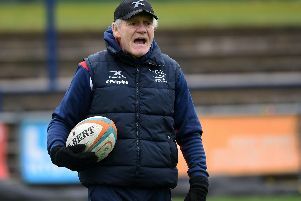 “They’ll be coming down and training with us but playing for Harrogate, unless they really stake a claim for a place or an opportunity opens up through injury. “It’s basically a chance to get these young lads integrated into a professional environment and see how they go.